Disused Victorian toilets under a busy main road will be turned into rooms for a bed and breakfast. The men's loos on St Giles in Oxford opened in the late 19th Century but were closed by the city council in 2008. The owners of the Galaxie Hotel in Banbury Road have been given planning permission for the project, the Local Democracy Reporting Service reported. Opponents said the plans clashed with treasured buildings nearby. Debbie Dance, director of Oxford Preservation Trust, said the design's "cluttered appearance" needed "more careful consideration". 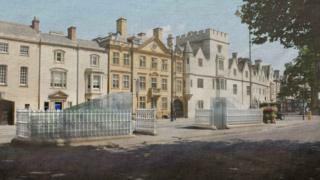 But Oxford City Council said it "would accord with the special character, setting, features of special architectural or historic interest" of listed buildings nearby, and that its planning officers had "carefully considered all objections". It said the objections did not "amount, individually or cumulatively, to a reason for refusal and that all the issues that had been raised have been adequately addressed and the relevant bodies consulted". A change from the original application means clear glass, instead of patterned, opaque glass, will be used for canopies covering the walk down steps and into the rooms. The conversion must be completed within three years. Harries-Jones Limited, which runs the hotel, previously said bookings would be taken for up to a week. The revamp would provide a "unique opportunity" to visitors to the city and "add quality and choice", it said. The toilets are situated opposite Martyrs' Memorial and have views of the Randolph Hotel and Ashmolean Museum.